Welcome to our seventh Development Status update. 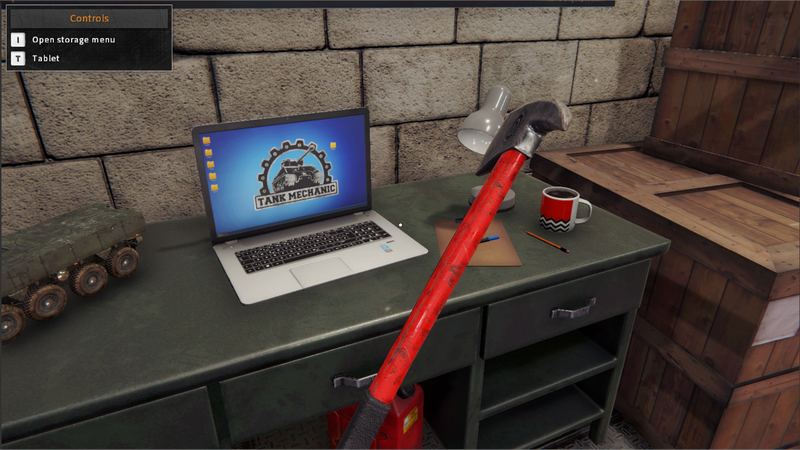 TL;DR The development goes forward at stable pace, take a look at the gifs and pictures and have a nice weekend! 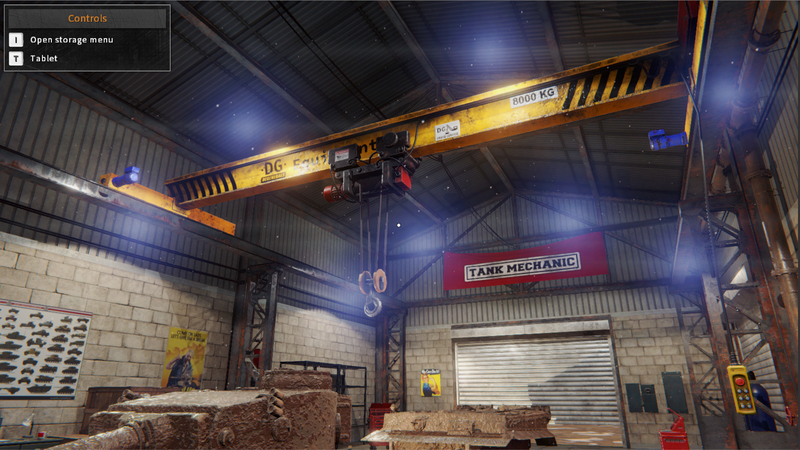 One of the tasks for this month was to add a working crane system for the workshop. In December we’re going to obtain Caronte FX Unity Engine extension from Unity Asset Store. It contains a different approach to physics in Unity Engine, it also has a system allowing towing, hanging an object on a rope. Will be usefull in crane scenario. The hammer can be used when standard procedures does not help. Some elements can be fastened to the tank with bolts / screws. When the bolts are very rusty, standard disassembly methods won’t work. We can use hammer brutal force to smash the element or the faulty screws themselves directly (if we can aim well enough) to get rid of the problem. The grinder for now can be used to cut rusted bolts that fasten an element. While cutting, the element drops to the ground and gets disassembled. Player can control the grinder position on the element, he can also change the angle of the grinding. 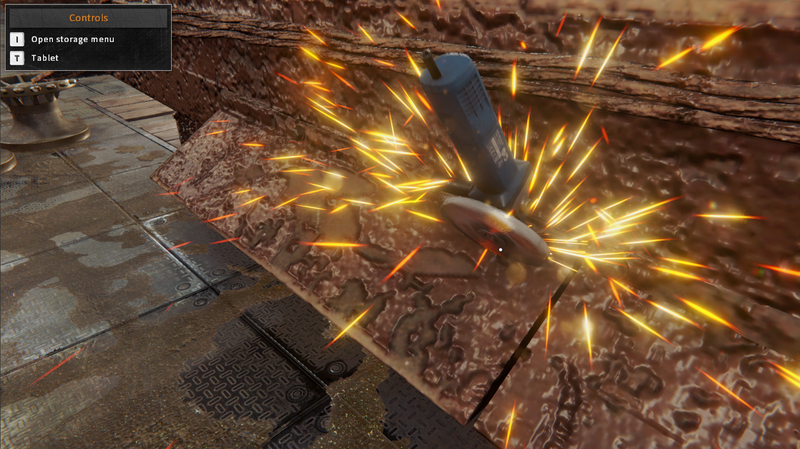 Surface cutting and grinding (to grind the rust off the element). 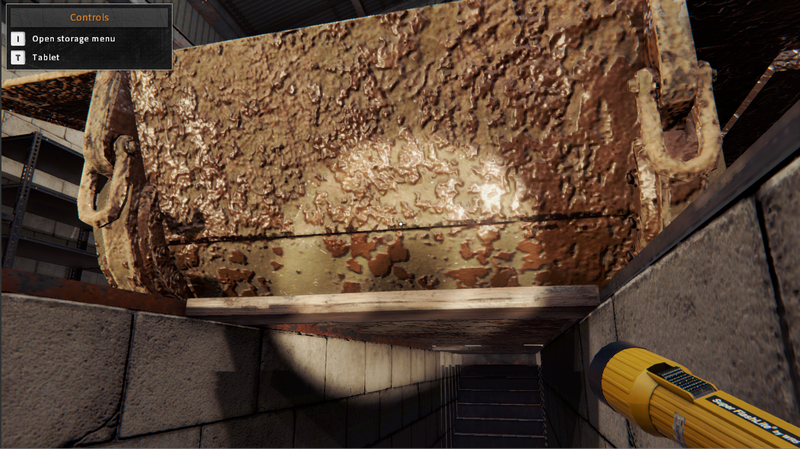 Cutting the surface will be available after we obtain a system allowing us to dynamicly cut the mesh of an object. Then we’ll need to find a way to save the fact, that the player has cut the element, where the cut was made and how to load it up. 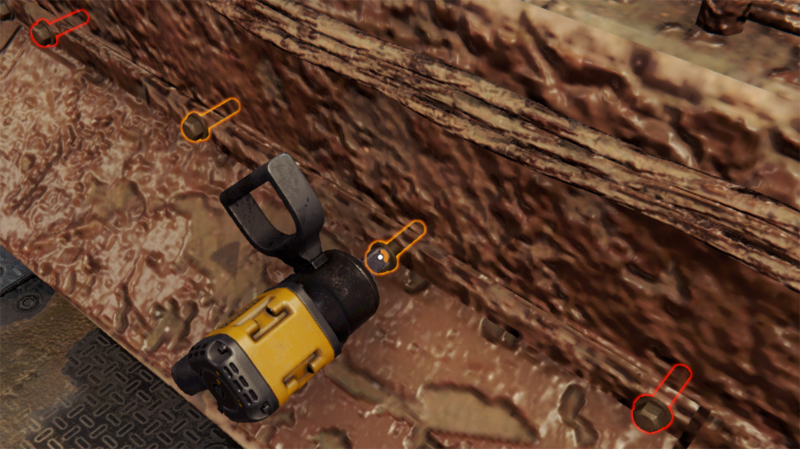 The flashlight equipable was our first approach to the inventory system. 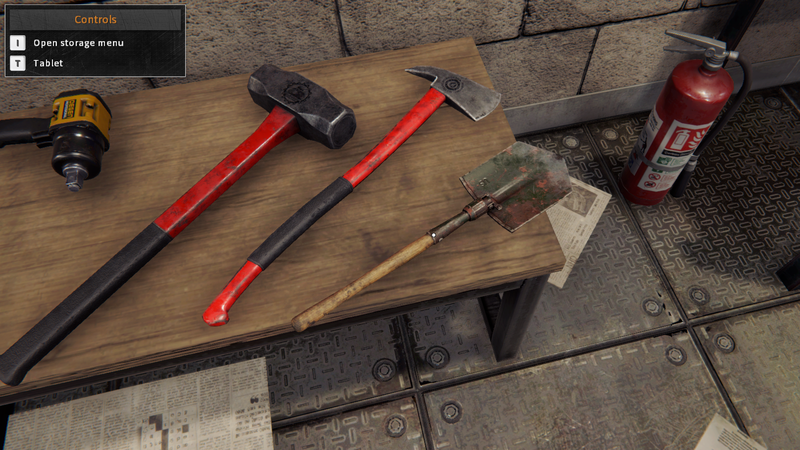 The mechanic will be able to manage his inventory equipment and what he holds in his hands at the moment. This tool will speed up the disassembly of the bolts. movable – ready to be disassembled at once without any tool needed. Wrench pistol will unscrew the bolt faster. rusted in – cannot be unscrewed. Only cutting and smashing works. missing – the bolt is missing. Player might need to buy a replacement. 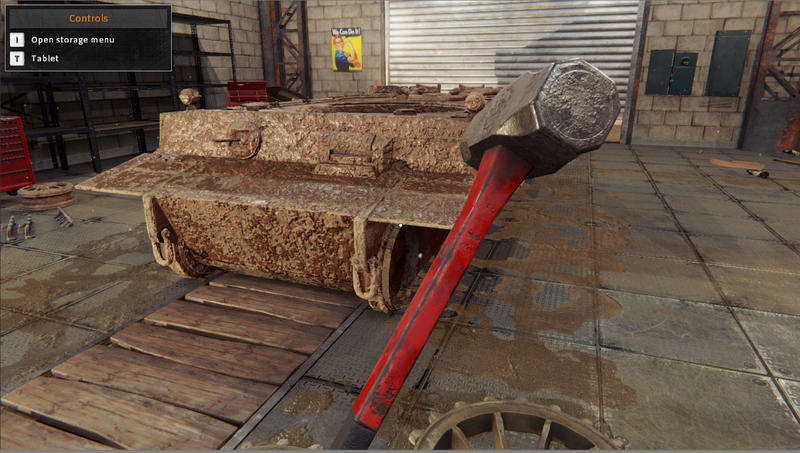 For now the shovel model is finished, we’re still far from developing the extraction part of the game, where the shovel will be useful. That would be all for this week and month. Remember to visit us on our DeGenerals discord server, where we are available most of the day (CEST zone). This entry was posted in Development Status on 30 November 2017 by Developer.